Fabulous Fall Selection from Kupcakes & Co.
My friend (and guest Crusader from our first California review), Julie flew in a week and a half ago to visit for a long weekend. For the most part, our plan was to visit Hersheypark because the amazing Megan Hilty, from NBC’s Smash, would be performing. However, I couldn’t host company for the weekend without cupcakes. This is what my friends have come to expect from me. I decided that we would take a “back way” home from the airport (to avoid traffic, of course!) 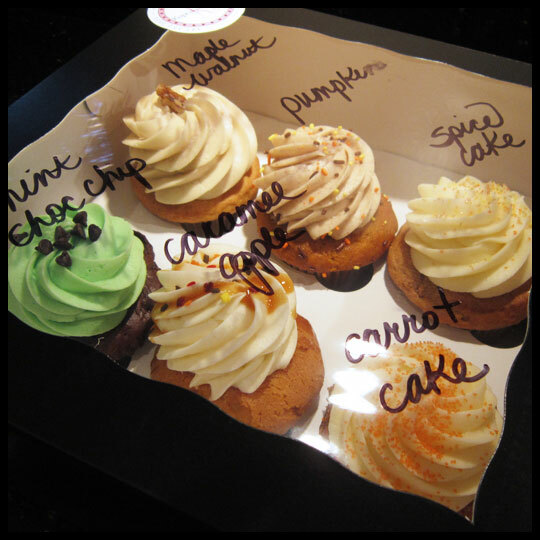 that conveniently took us past Kupcakes & Co. On this day I was able to take home all five of the new fall flavors! Michelle, owner of Kupcakes & Co., was very generous and also gave us a non-seasonal cupcake, a cupcake parfait which Stacy had been dying to try, cake pops including one fall flavor, and cookies! We left with more than enough to take us through the weekend! 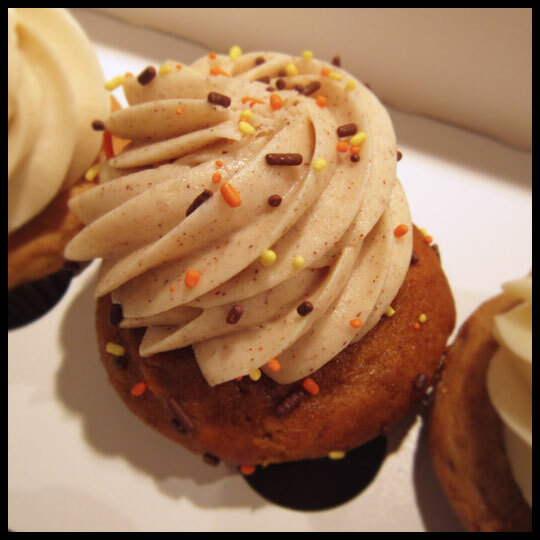 When I told Stacy that I would be stopping in Kupcakes & Co., her instructions to me were to bring her a fall treat. Her order of priority would be a parfait first, then cupcake, then cake pop. Unfortunately, they didn’t have any fall flavored parfaits but when Michelle heard that we still hadn’t tried one and how much Stacy wanted to, she wouldn’t let me leave without selecting one of the three options being offered that day. I choose the Salted Caramel Chocolate because caramel is a good flavor for the season (I think I’ll have to go back for the chocolate raspberry). 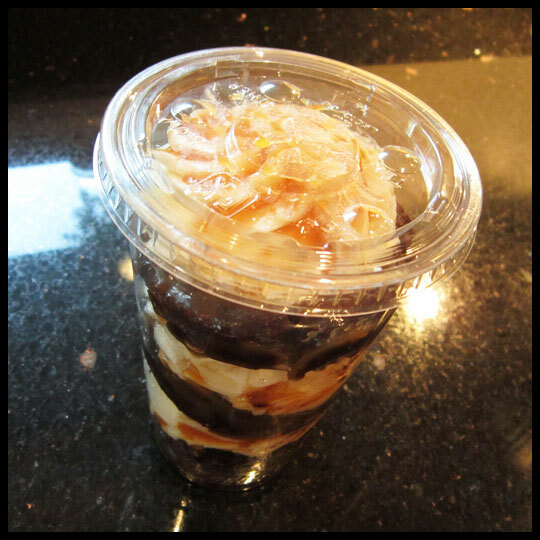 As you can imagine, a dessert layered with frosting and caramel is sweet! We’ve tried the cupcake version before but Dan (my hubby) really loved the parfait. I think he’s addicted now. Maybe it’s the size? Or all the frosting? But he has found a new love. I have to be honest, I might be addicted now too. 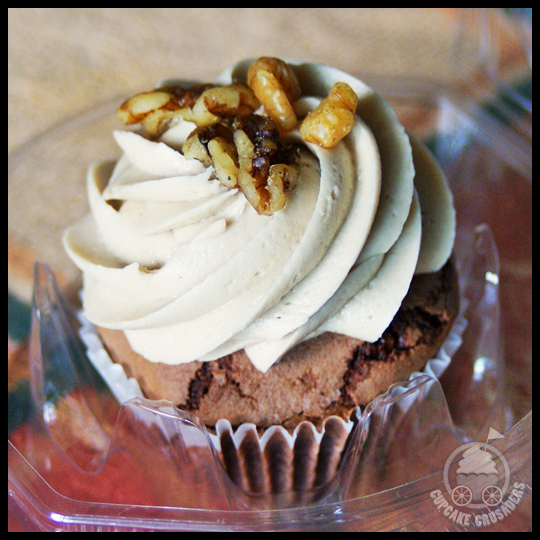 The Maple Walnut boasted a ton of maple flavor. Because of this, it would be difficult to finish a whole one without a cup of milk nearby, but I loved it. It reminded me of the maple candies I used to pick up every fall on a trip to Deep Creek with my hubby. 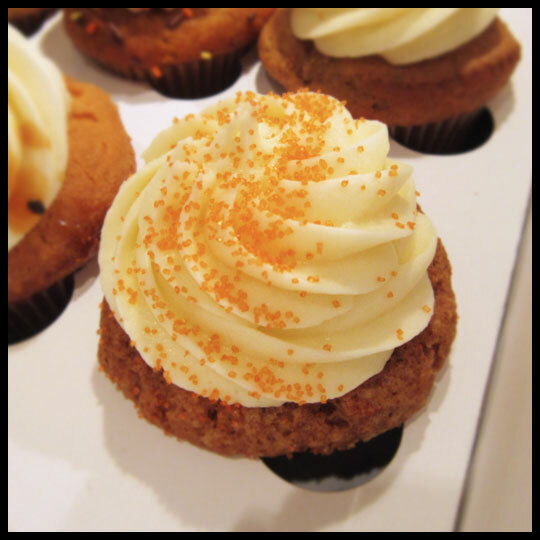 Pumpkin is definitely the most popular flavor of the season. And, I’m admittedly obsessed with it. 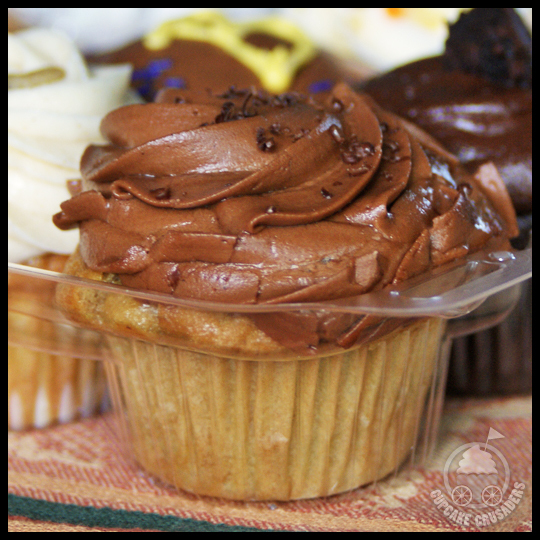 This cupcake had a cake that is denser than Kupcakes & Co.’s usual cake, but that’s expected with pumpkin, and it was so moist! 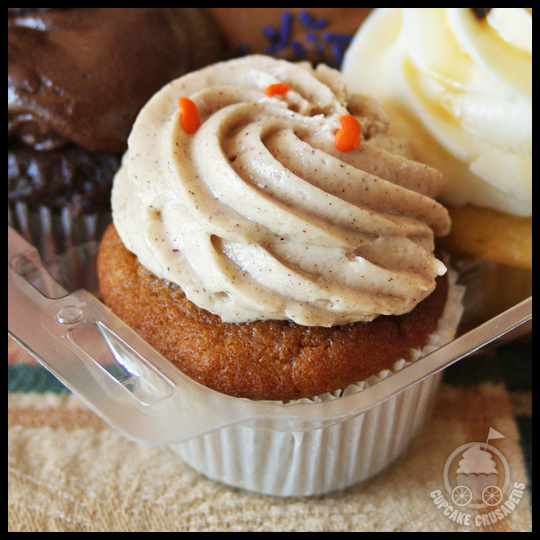 The thing that sets this cupcake apart from other pumpkin flavors is the tasty cinnamon cream cheese frosting that was a perfect complement. 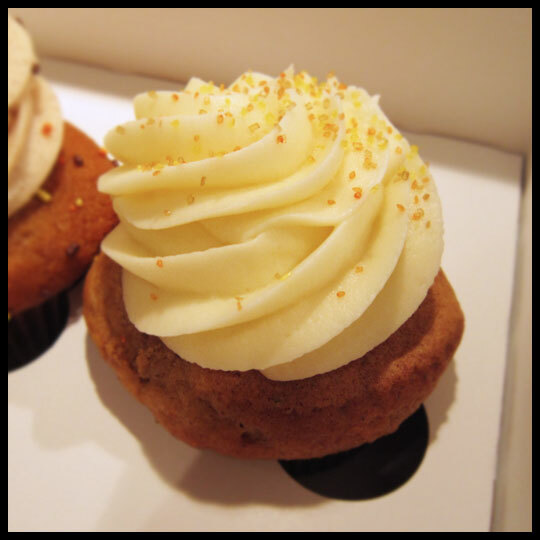 We expected the spice cake with cream cheese frosting would be similar to the carrot cake in flavor but were pleased to discover that it has its own distinct (and delicious) taste. Stacy pointed out that the spice flavor, from the nutmeg used, would make it perfect for the winter holiday. 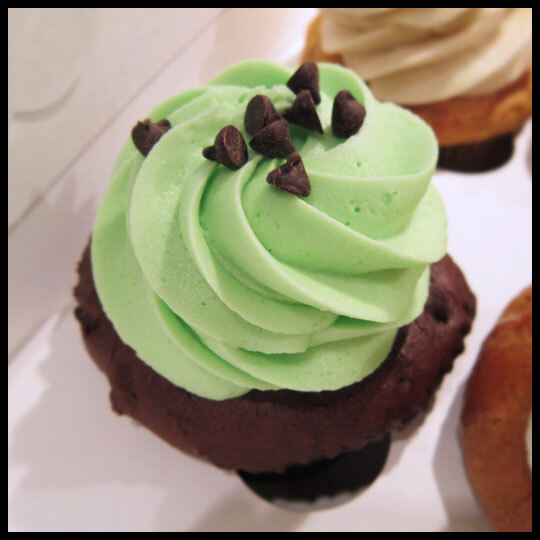 Hopefully Kupcakes & Co. will consider carrying this cupcake into winter. 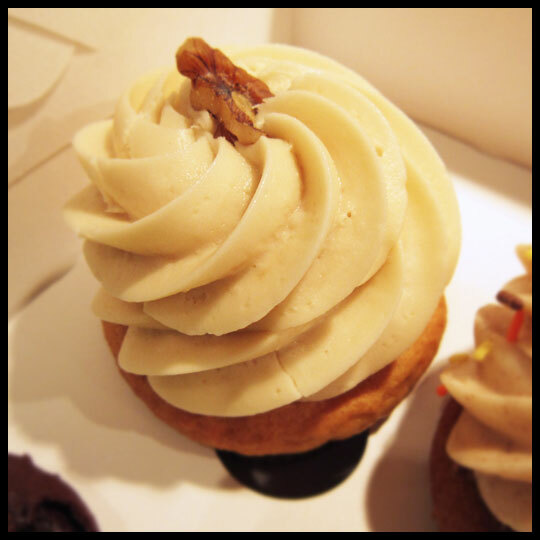 Another favorite combination of the season, this cupcake had a moist apple cake, vanilla frosting, and a caramel drizzle. 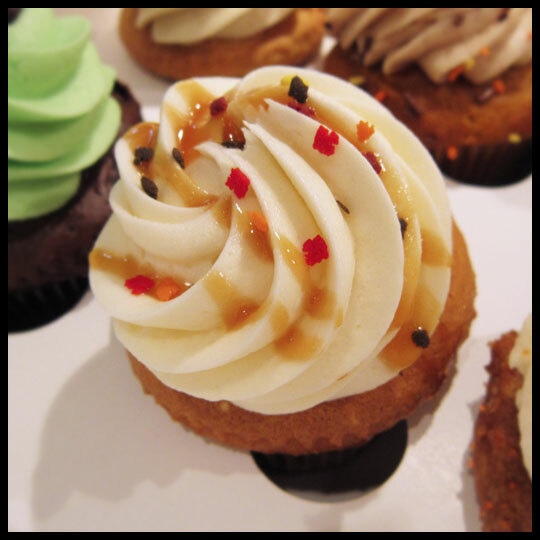 As far as apple caramel cupcakes go, this one was a little too sweet for me. Since Stacy, Julie, Dan, and I were sharing, I only got a portion and I would have liked more apple in my piece. 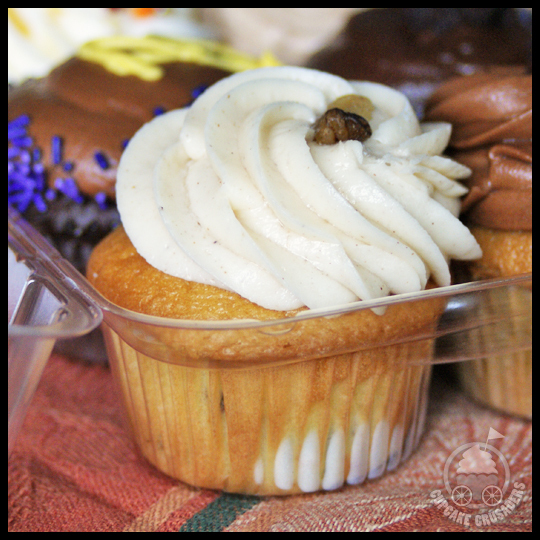 Like most, Kupcake & Co. tops their carrot cake with their awesome cream cheese frosting. It’s one of the best I’ve had…not too sweet, great spice in the cake, and great texture with fresh shredded carrot and nuts. 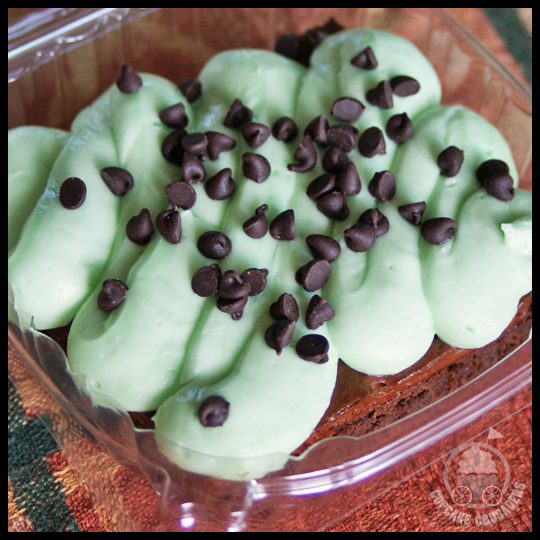 The Mint Chocolate Chip is definitely the odd-ball in a group of exclusively fall flavors. It is not one of their fall selections, but sneaked its way into our box. As much as I wanted to dive into it, I let Dan have this one all to himself, as a consolation prize for staying home with Leah while Stacy, Julie, and I had a girls’ dinner out. You’ll have to take his word for it when he says it was delicious. I think we can trust him, since he’s been on many, many crusades with me. 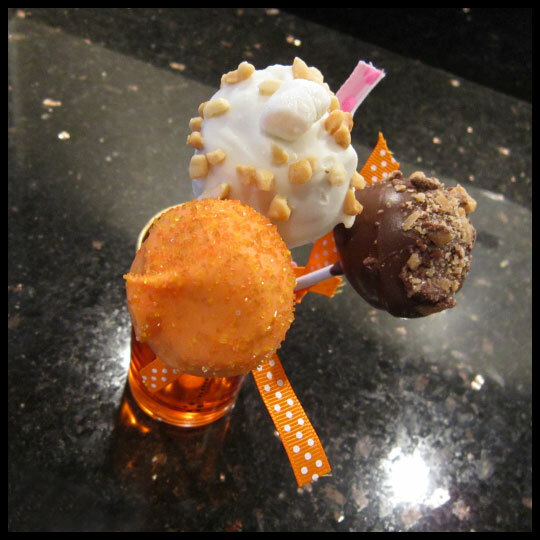 Stacy called dibs on the Pumpkin cake pop (the bright, orange colored one), so that left the rest of us with the Dark Chocolate Hazelnut Crunch and Peanut Butter Marshmallow White Chocolate (Fluffernutter?) cake pops. I thought maybe Stacy was the lucky one after she raved about the Pumpkin cake pop, but upon trying the Dark Chocolate Hazelnut Crunch, I’d pick it again in a heartbeat. 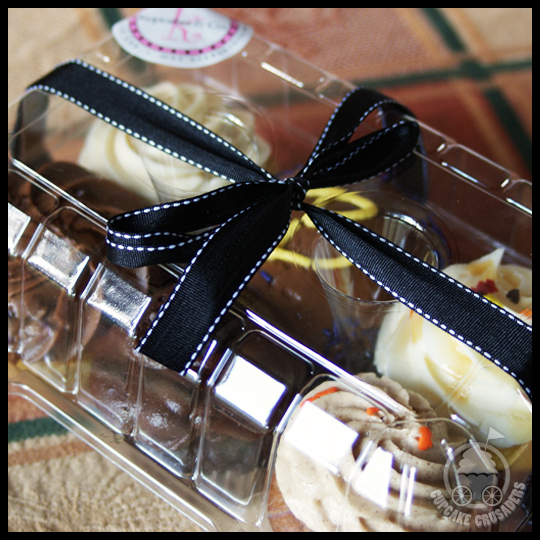 Kupcakes & Co. has been serving up cookies, along with biscotti, buckeyes, and other non-cupcake goodies, for a while now, and they really know what they are doing when it comes to baked treats. 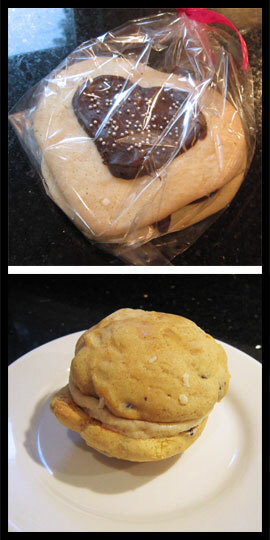 This time we got to try their large sugar cookie sandwich with chocolate ganache filling and a pumpkin chocolate chip sandwich cookie. It was so good. I mean REALLY good. 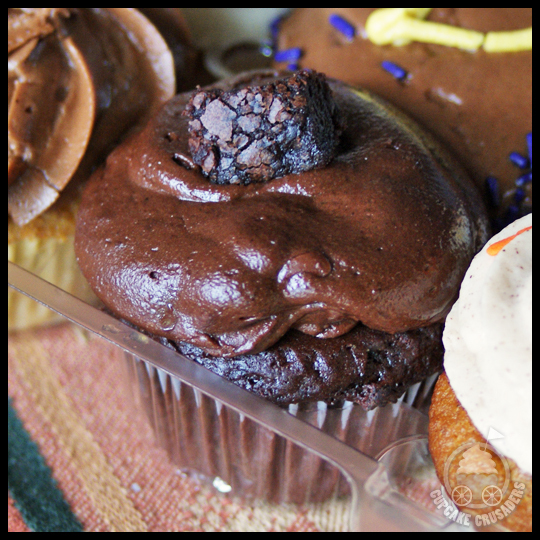 So, if you are in there for a cupcake, don’t turn your nose up at the cookies.